NB: I purchased this product with my own money and have not been given any incentive, monetary or otherwise, to review it. So this review has been a bit of a long time coming. I first saw this serum on Wishtrend when they were recruiting testers. I didn’t get selected to test the product, but I was interested enough to buy it when it was released. Unfortunately, that was right before my wedding and honeymoon, so the testing process was delayed and then interrupted. But I’ve been using it for a month (minus the week of my honeymoon), including three weeks uninterrupted at this point, so I’m going to give you my thoughts. The short review is that, honestly, I wasn’t that impressed with this. I mean, my skin has been looking good lately, but it doesn’t really correlate with using this product (it continued to improve while I was on my honeymoon without it). Alright, so here’s the deal with the I’m From Ginseng serum. 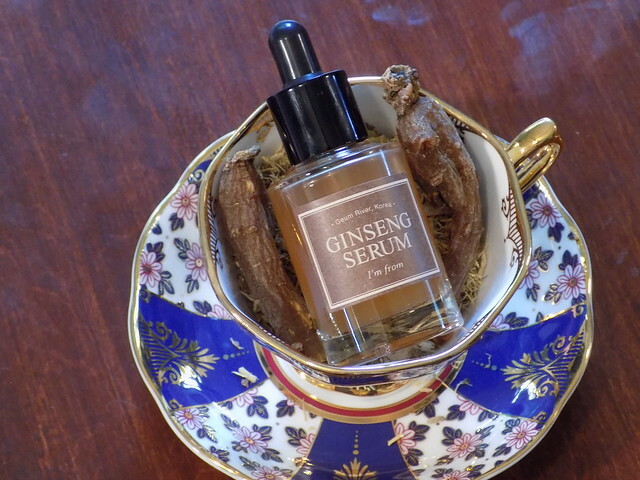 It has 7.98% red Korean ginseng extract (although the word “extract” can be variable in strength), along with a bunch of other extracts and oils to help aging and dull skin. Its color definitely convinces me that it’s pretty packed with herbal-y goodness (and there are no explicit coloring agents in the ingredients list), and it includes extracts like licorice and peony (for brightening) as well as green tea and adenosine (for anti-aging). Ordering the serum was uneventful, particularly since the serum is in Wishtrend’s “Free Shipping” area and the only thing I paid for was a couple dollars for a tracking number. It arrived in a couple weeks, actually sooner than I had expected. When it arrived, I swatched a little on my hand to see that it is a viscous liquid/thin gel, with a pale brown color and a distinct floral scent. Honestly, I wish they hadn’t put a fragrance in it, as the fragrance is the primary reason I’m not terribly thrilled with it. I’m a lover of floral scents, but this has a powdery, artificial floral scent to it that isn’t terribly pleasant when doing my (largely unscented) evening routine. I find the serum lightly hydrating and not sticky. I dispense four drops into my palm, spread it between my hands and then press onto my skin. I only applied this in the evenings, after actives and hydrating toner, and before facial oil and emulsion/cream. If I sheet mask, I apply it under the sheet mask. At this point, I’ve been using it for about three weeks uninterrupted since my honeymoon, plus an additional week before I left on my honeymoon. The main thing I notice is the smell. I’ve noticed a decrease in acne and an overall increased brightness in my skin, but it’s something that has been going on pretty steadily for the last few months, and hasn’t been markedly more pronounced since using this serum. 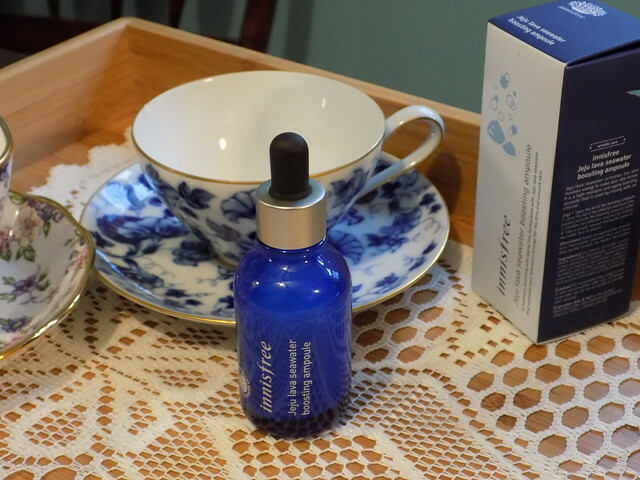 And, as I mentioned before, I actually saw the effect pick up while I was in Scotland with an incredibly abbreviated routine, not using this serum. So I’m honestly not convinced that this serum really does much for anti-aging or brightening. I do have some early signs of aging (I’m only 34, guys), including a deep-ish forehead wrinkle and some fine lines around my eyes, as well as some PIH from acne on my jawline. But I honestly think that increasing my hydration with multiple applications of hydrating toner, as well as using acids regularly has done more to decrease these things than this serum. In short, I will not be repurchasing this. Say that one five times fast. Despite a mouthful of a name, the ampoule alone isn’t much to write home about. But I was intrigued when I learned about the concept. You buy the base ampoule, and then you buy tubes of “effectors,” which are concentrated shots of ingredients targeted at one concern. You can then add the effectors into the base ampoule to create a custom ampoule for your skin concerns. I was tempted enough to buy it. It’s just such a cool idea, plus I’ve been curious to try more Innisfree products, despite their fondness for filling a product with more fragrance than substance. Well, this seems like a bit of an exception. While the base ampoule itself is relatively simple (solvents, humectants, penetration-enhancers, etc. ), the effectors had some interesting ingredients (although full ingredients lists don’t seem to be available). 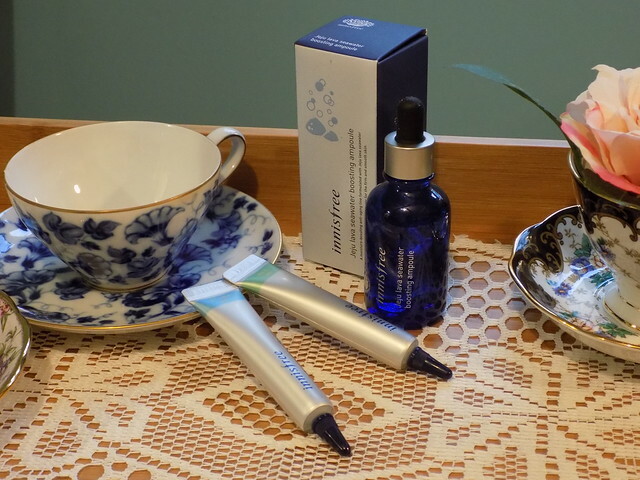 I went with the Wrinkle effector, which boasts a blend of peptides and adenosine, as well as the Pore effector, whose star ingredient is catechin, one of the antioxidants in tea. Seems like a fated match, right? I ordered the product from the company Jolse, where the ampoule and two effectors cost about $25 when various, publicly-available discounts are taken into account. It got to me in just under three weeks. I started testing it on April 8th and have been using it for about a month now to gauge results. The first thing I noticed upon opening it was that there is absolutely no scent at all. For those who are familiar with Innisfree products, this is kind of a big deal. Innisfree has released some new products recently with a focus on less fragrance and sensitive skin types, so perhaps this is going to become a new direction for the company. Neither the base ampoule nor either of the effectors had any detectable scent, and I really sniffed hard to try to find something. The base ampoule is 25 ml of product in a 40-ml bottle, to allow for the extra volume of the effectors (so don’t be surprised if your bottle only looks just over half full), and each effector is 7 ml, so two effectors is probably the most you should add, for space reasons. It’s likely that Innisfree designed the products to work well with the base ampoule and two effectors, so that’s what I did. The base ampoule is a clear liquid that’s a bit more viscous than water. The Wrinkle effector is a thin, creamy liquid, and the Pore effector is a clear gel. I did find that the effector formulas were thick enough to get stuck in the neck of the ampoule bottle when I tried to add them in, but I think I could avoid this next time by making sure to use the pointy end of the effector tube to poke down beyond the neck of the bottle. The ampoule bottle has a dropper top and a mechanism to wipe off drips from the dropper. I used this product at least once a day, often twice a day, at a rate of 4-5 drops per application. At this rate, I have used just over half the bottle, so I think that with daily usage, you would likely get over two months out of a bottle, and with twice daily usage, just over a month. I found that for the first few days to a week, my skin really soaked up the serum and it was easiest to apply drops directly to my face and spread it with two fingers to minimize hand absorption. Later on, however, I felt like I could get even coverage by dispensing into the palm of my hand and pressing the serum into my face. This was the only serum I used during the testing period, other than my vitamin C in the mornings. As far as effects go, I didn’t notice any miracles, but then I wasn’t expecting any. I was actually pleasantly surprised with the effects I did notice. The product is at least as effective at keeping my forehead line at bay as my Hylamide SubQ, for a significant financial savings. It also seemed like my clogged pores diminished, although not to the point where it showed up on camera. I did take before and after photos, but I noticed no difference between them, so the positive effects were subtle. I’m curious to see how my skin reacts to stopping using this, as that’s often the only test that will tell you what subtle results a product is having. I would say that if you’re interested in this product and the price doesn’t seem dear to you, it’s a nice product for the cost. It won’t work anti-aging miracles, but it is a nice booster to a good anti-aging regime. NB: I purchased this product with my own money and have not received any incentive to review it. All thoughts are my own. This weekend was pleasantly busy. We started with a Friday date night at our favorite Japanese restaurant, then went to a wedding Saturday night for two of Boyfriend’s friends, and capped it off by getting brunch with an old friend of mine Sunday late morning. Boyfriend was running about prepping for a business trip Sunday night, and was throwing laundry in so he could pack. At which point, he realized he couldn’t find his phone. We tried calling it from my phone, but he remembered he’d never taken off “Do Not Disturb” after the wedding ceremony Saturday. But after about an hour, he did finally find it. In the washer. After the cycle had finished. He washed his phone right before going out of town. Needless to say, he felt frustrated with himself and I was mildly irritated that he was going to effectively be out of contact while traveling. It almost turned into a fight while tensions were high. But instead, I say “screw this” to myself and decided to do a mask. Now, I usually mask on Sunday nights, but I had bumped my masking up to Saturday so I could be dewy for the wedding (which happened in a downpour, so dewiness wasn’t really a trick). But I have a stash of 50 masks and even though some of them might be fancy or expensive, there’s not really much point in buying nice masks if I don’t use them, right? So I double-cleansed, toned, applied some first essence, and then pulled out an illi Orchid Moisturizing mask. A lush, 2-piece, microfiber mask soaked in an surprisingly thin, wet essence that smells lightly of a beautiful flower garden. It was cooling and soothing and lifted my spirits while I just lounged for almost an hour. And when I peeled it off and topped off with some facial oil and cream, I felt so much of my frustration just disappear. Self care. It’s a wonderful thing.